EUROPEAN union chief election observer Mr Elmar Brok yesterday paid a courtesy call on President Mnangagwa and briefed him on the purpose of their visit to Zimbabwe. 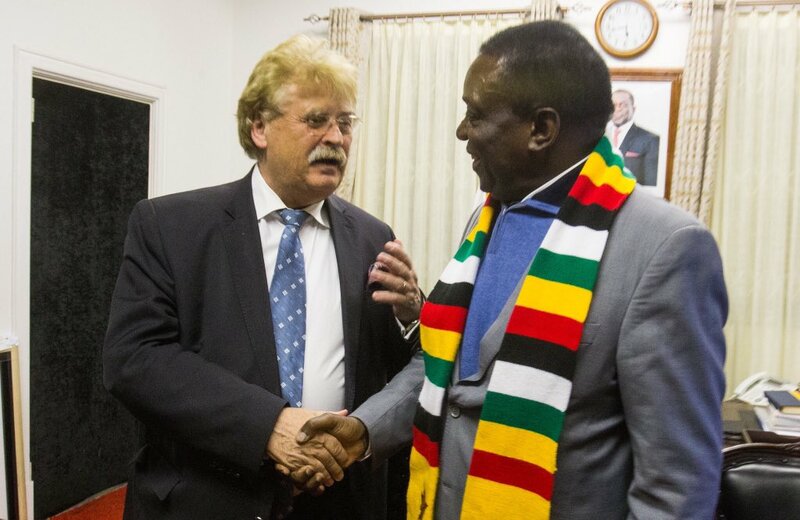 The head of the EU observer mission in Zimbabwe visited the President in the company of his deputy Mr Mark Stevens and the EU Ambassador to Zimbabwe, Mr Phillipe Van Dame. Mr Brok said he had had fruitful discussions with President Mnangagwa. “I have explained to the President why we are here. We believe in free and fair elections which brings people together. “It is most important for a peaceful country and it does not matter who wins. We would like to see that happening. It should not only be a creation of fairness on the election day but fairness must also prevail even in the run-up to the elections. “Our findings will determine which type of elections we will have here in Zimbabwe,” said Mr Brok. EU has deployed 44 long-term observers throughout the country ahead of the harmonised elections on July 30. High Representative for Foreign Affairs and Security Policy and Vice-President of the European Commission Mrs Federica Mogherini also appointed Mr Brok, member of the European Parliament, as chief observer of the EU EOM to Zimbabwe. In a statement, Mrs Mogherini said the Zimbabwean elections were key for the country. She said the future President, Parliament and local Government councils would have the responsibility of steering the transition process in the country. Mr Brok said the elections, to be held under a new electoral framework, represented an important step in the country’s political transition. The EU said the 44 observers team was the second contingent, following the core team consisting of 10 analysts which arrived in Harare early last month. The team will stay in the country until the completion of the electoral process and then prepare a comprehensive final report. Together with diplomats accredited in Harare, the EU EOM is expected to deploy on election day about 140 observers from all 28 member states as well as Norway, Switzerland and Canada.